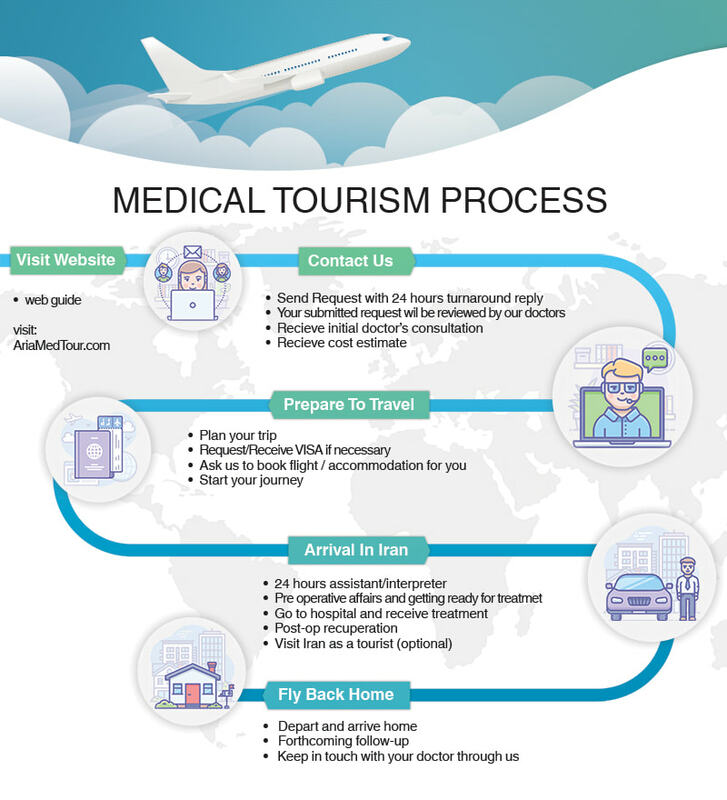 Medical Tourism Process Flowchart - How Do We Work? Visit the website and find your treatment (Medical or Cosmetic) and collect information about that from the website. A 24-hour response by our medical experts using (inquiry form, E-mail, WhatsApp, Viber, Telegram, Skype, online chat, phone and …) is available to satisfy the needs of patients. Send your information including important details about your condition (if possible, send medical reports/records, diagnostic images, etc.). After collecting the basic and necessary information regarding your condition, needs and requirements, the doctors do their best with the aim of proper assess to your case. A complete outline of the surgical and recuperation period for your selected surgical procedures (details about that, treatment duration, recovery time …) will be prepared. Moreover, you can have a comprehensive treatment offer, treatment letter and travel plan. A list of top international clinics and hospitals that matches our high quality standards will be shown to you as offers so you will be able to see the facilities each hospital provides. All treatment costs are (such as clinic, hospital, doctor, laboratory and …) estimated clearly. Set an exact date of arrival to Iran and organize your trip. Apply for visa, ticket, airline and …. Also, you need to consult Aria Med Tour for the time and date of arrival. We will estimate the costs of your accommodation and services clearly (select hotels or apartments according to the budget). We book you the best clinic, hospital, hotel, laboratory and arrange everything in advanced according to your exact date of arrival. Your personal assistant will greet you at the airport and pick you up from airport and will accompany and aid you throughout your medical trip till your departure (male or female experts, depends on the patient’s choice). Staying in hotel; transferring you to the clinic, visiting the doctor, do the lab tests, check everything, pre-operative consultation with the surgeon and going through other processes. In the hospital, the medical team will perform pre-surgery, surgery and final check. Also, the patient’s demand ‘will be reviewed with the surgeon and the specialist anesthesiologist. After surgery and recovery, the doctor will do the follow-up consultation. You will be accommodated at one of our special hotels until you are ready for your leave. You will be transferred to the airport. But before that we look forward for your comments and feedback to improve our own medical tourism organization. After coming back to your country, we will keep our contact with you and we won’t lose touch (a member of Aria Med Tour follow-up department will be available almost 24 hours). We will be at your disposal (any time) to answer all your postoperative questions by coordinating with your surgeon. To be in touch with your doctor as long as you wish.